The old knowledge base used to be not the most pleasant experience for its visitors. It served its purpose at first, but the more articles were added to it, the less efficient was it becoming. At some point, the clunky structure and the archaic design had become too much of a problem, and that’s when we decided it was time to make changes. 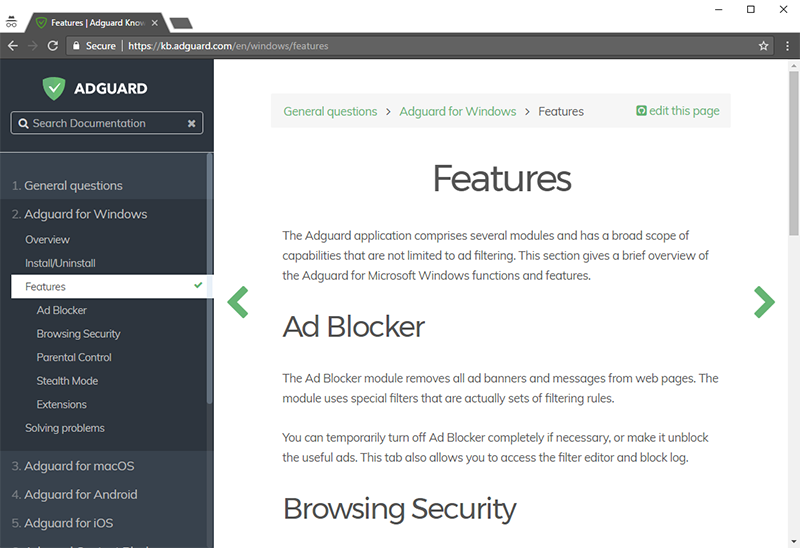 You sure notice the new structure: every Adguard product has its own category, and some of those have their own sub-categories; the whole design ultimately aimed at the reader’s convenience. This way, you can effortlessly navigate through the articles and find just the one you look for. And what if you’d like to learn about a certain concept or some particular setting but it’s not clear what article exactly to look for? Well, we’ve got this covered for you. Just use the live search feature in the top-left corner. ’Live’ means that it will filter the results as you start typing (just like most modern online search engines). Try it out, it is really awesome! Deciding whether you should buy a license or not and want to read about the basics of a product first? Aren’t quite sure what this one setting stands there for? Or did you stumble upon a bug and are looking for a quick solution? It doesn’t matter; chances are you will find the answer here. A lot of articles were transferred from the old knowledge base, and others were written from scratch. I have to admit, there is room for improvement, and that’s our primary goal now. More content will be added — detailed descriptions on different Adguard products, solutions to the most common issues and what not. We really want to make this a place where you come to with a question and leave with an answer. If the worst comes to the worst, you can always contact the support — the link is always at hand in the ’Technical Support’ section. Ok, ok, I know, everyone has their own taste when it comes to looks, and you can’t satisfy them all. But we tried to! We chose the minimalistic design with neutral colors so that nothing diverts your attention from the content (and that’s presumably what you came to the knowledge base for in the first place). Another cool thing to notice: it doesn’t matter if you browse the knowledge base from a mobile device, it will always readjust to fit the screen and keep the high readability. The same applies when you resize the browser window on a computer screen. It is very likely that some of you have been using the KB website to report problems. For those it will be important to notice that from now on, all conversations with support will be carried through the email only. The old website is not available anymore, and it means that if you have any open tickets left, you won’t be able to access them through the familiar interface. But don’t worry; the support has retained all correspondence and any other important information and will contact you in the nearest future. In case you weren’t reached by support for some reason, or if you want to file a new ticket, just send an e-mail to support@adguard.com.